We roast to order! This means that your coffee is packaged and shipped within 48 hours of roasting ensuring that your coffee is always fresh. We also offer smaller minimum orders as well as free shipping on orders over $100 to help you keep your inventory fresh and your customers happy. Along with your tastes and interests, also consider your customer base when selecting your coffee. Are your customers open to unique and innovative coffees (if so, ask us about our Chocatal and PowerCafe) or are they more traditional and prefer a French Roast or a Breakfast Blend? 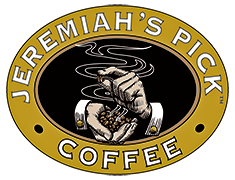 We recommend sampling a range of Jeremiah’s Pick coffee from light to medium roasts in order to find your right roast right taste. Step 2. Designing an attractive label. While we do not have a graphic design service in house, Jeremiah’s Pick continues to work with highly experienced food product designers. We will match you with a designer with guaranteed quality at very competitive rates available to us and our clients. When working with a provided designer we offer full support and consulting at no additional charge. We feel the best labels are ones that focus on representing the brand as well as catching the attention of the customer base. Step 3. Choosing a printer. As in every business, there is a huge range in quality and price when selecting a printing company to print your labels. Plate printing, which is more expensive than digital printing, still carries a better reputation for producing a higher quality product. Having said that, there have been many companies that we work with who have opted to have their labels printed digitally with great success. We would be happy to recommend a printing company to you that fits your budget and project. Step 4. Choosing your packaging. We offer you an assortment of valve bags that are available for 10, 12 and 16 oz sizes and in an assortment of colors. Also available are sample size silver foil pillow pack that are perfect for offering your customers a taste of your product or a token of your brand they can take home to enjoy. Step 5. Selling your coffee.